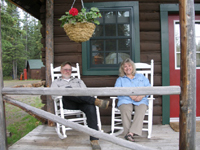 Like most Alaskan's, Richard and Judy Dennis bring a unique and varied background and experience to their role as host and hostess - and occasional guides - of Red Eagle Lodge. Richard has lived in Alaska for 35 years, mostly in the "bush." He has been an educator and administrator for 25 years. Richard owned and operated a 37 foot fishing boat, seine and gillnetting salmon in the Aleutians for 3 years. He was also a general contractor in Anchorage for 5 years. He is a hunter safety instructor and a Ham radio operator advanced class - KL7iol. renovating a historic farm house in the orange groves of the San Joaquin Valley, California. Between them, Richard and Judy have 5 children. Richard's passion is flying. His Cessna 182 waits outside Red Eagle Lodge on the grass runway. 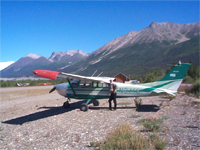 In addition to exploring Alaska, the 4-seater bush plane has taken Richard and Judy from the Arctic to the Grand Canyon, and from Russia to the Great Lakes, Eastern U.S. Richard loves to swap stories with fellow aviators and share adventure. He and Judy both say their most memorable trip was with the Alaska Airmen's Inaugural VFR flight in 2003 from Nome, Alaska to Providenia, in Russia's Far East, also known as Siberia. Richard and Judy discovered Chistochina's historic roadhouse site while traveling back from Dawson during the end of summer 2006. Richard remembered well the beauty of the area, the lodge and property, and the adjacent runway, from his early years driving the ALCAN. 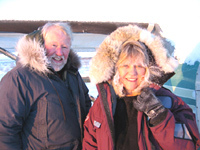 Returning to their home in the Arctic near Kotzebue, where Richard was serving as school principal for 200 Eskimo students, Richard and Judy began negotiations to acquire Red Eagle Lodge, its cabins, and campground. In the summer of 2007, they moved in and began renovations to the cabins and construction of the 30' x 50' log bathhouse, hand scribed from forest fire downed logs. The project continues to grow and includes plans in the near future for solar and wind power. Richard and Judy are excited to own/manage this historic property. They feel privileged to be entrusted with its preservation; they look forward to meeting you and will do all they can to help make your stay memorable. Visit with your hosts in the evening around a campfire or barbeque, or start your day with them over breakfast at the lodge.